The journey we begin at Baptism becomes more intense and focused during the process of Formation in the Presentation Congregation. There are many steps to the process. 1. Contact us – if you feel that you have read or heard about the Presenation Congregation and would like to know more about us and meet us. 2. Inquiry Phase – this initial period will help you further discern your call. You can regularly meet a Presentation Sister and discover where the Spirit of God is leading you at this time in your life. 3. 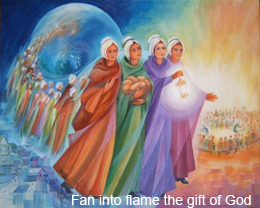 Application Phase – when you and the Presentation Sister journeying with you feel that your call to Presentation is deepening and through more intense contact, retreat/discernment weekends, live-in experience, meeting the Sisters in different communities and ministry experiences, you reflect deeper on your unfolding call. 4. Pre-Candidacy Phase – is a time of deepening your understanding of the Presentation charism and meeting the Sisters on a more regular basis, for communal prayer, sharing life and building relationships. 5. Candidacy – begins with a simple Prayer Service where you are now a candidate with the sisters and share more intensely with them your transition to community life, have more regular meetings with the sisters and engage in ministry with them. You prepare for entrance to the Novitiate. 6. Novitiate – following successful Candidacy, you are accepted for Novitiate with the Presentation Sisters. This is a serious time of prayer, reflection and study of religious life while living in Community. You reflect on the world around you in the light of the Gospel. 7. Temporary Profession – is upon completion of the Novitiate, you formally become a member of the Community, by committing yourself by the vows of Poverty, Obedience and Chastity, lived in community. This is an incorporation period which lasts up to six years. During this time you are in ministry or studies while you further deepen your desire to centre yourself on God. 8. Final Profession – is after completing the period of Temporary Profession, you take final vows as a Presentation Sister.